Coming up through school, teachers refused to believe him when he introduced himself and the other kids made fun of him. He's since come to embrace the name - and so has his mother, Yolanda, who wanted to name him after Puerto Rican pop star Chayanne (which shows that perhaps both parents aren't the world's greatest decision-makers - or are at least total nerds for different things). These days, Optimosprayn is accustomed to the jokes. 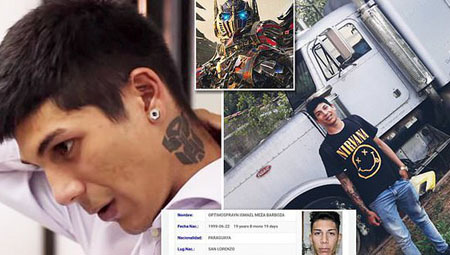 He's even got an Autobot tattoo on his neck. "The comments that are bad I just listen and laugh at now. And there are some that are funny. If you're not going to laugh, it's a lost day." This entry was posted in random and tagged Transformers. Bookmark the permalink.